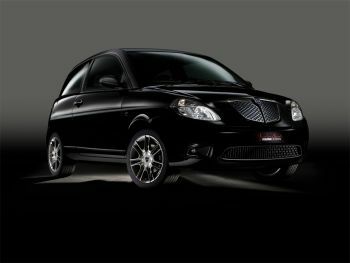 The Ypsilon VERSUS show car is the forerunner of a special series that will be produced in a limited edition (500 cars) and marketed from March 2009. The new Lancia Ypsilon VERSUS to be shown in Paris next week will be the limited-edition version of the Ypsilon, building on a tradition of previous concepts on the theme, including the Ypsilon Momo Design (above). It will be introduced at the 2008 International Paris Motor Show, a Lancia Ypsilon VERSUS show car produced with the Versace Group brand that will also dress the models on the stand with garments chosen to suit the expressive motifs of the exhibition space. All this confirms the strong bond between Lancia and the world of Fashion. Together with Design and Cinema, Fashion is one of the brand's languages of reference, as is borne out by the choice of Lancia cars as official vehicles for the Milan fashion week. The Lancia Ypsilon continues to cause a stir, confirming its place as a true icon of Italian design. This time, it is the turn of the ‘Ypsilon VERSUS’, an original version created as a result of collaboration between Lancia and Versus, a Versace Group brand that has always been a byword for exquisite styling innovation. With its pronounced tendency for a young, dynamic style, Versus reflects the taste of an audience that is very aware of fashion trends and full of vitality. Attention to detail, care over proportions and top-quality workmanship and materials are the strengths of the brand collections. So it seemed quite natural to combine the VERSUS brand with Ypsilon, the Lancia model directed at the same young and sophisticated audience. The show car is the forerunner of a special series that will be produced in a limited edition (500 cars) and marketed from March 2009. The car confirms Lancia’s interest in the world of fashion. Despite the apparent differences between motoring and fashion, the two worlds actually share important qualities such as talent, creativity and innovation. The winning ingredients of world-renowned Italian style, in other words. The ‘Ypsilon Versus show car’ features certain exterior features of great visual impact. 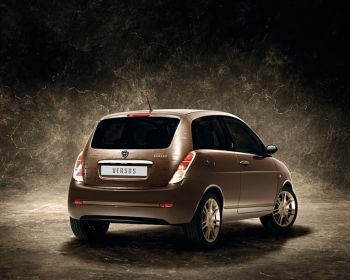 Beginning with the special Bronzino Bronze body colour that bears a screen-printed ‘Versus’ logo on the roof. The exterior also boasts bronze 16" alloy rims. The original bronze chrome finish is also repeated on the grille, handles, moulding on the doors and rear bumpers and tailgate handle, sporting the Versus logo. The same strong personality is evident inside, as borne out by special upholstery produced with a band in a cloth that recalls the world of fashion – and a central area in brown leather with a ‘Versus’ logo heat-printed in relief, just as on the accessories produced by the fashion brand. The same craftsmanship has been lavished on the pearl-effect leather of the head restraint, adorned with an embossed VERSUS logo, on the dashboard and on the door panels. Everything has been made even more elegant and exclusive by detailing on the instrument panel, sill plate and gearbox that also have the same bronze chrome finish as the exterior features.